The Ripley County Sheriff's Office Mums for Education scholarship for students pursuing a career in criminal justice was a great success. The recipients this year were Lauren McIntosh of South Ripley High School and Logan Miles of Milan High School. Both students received a $1000 scholarship. 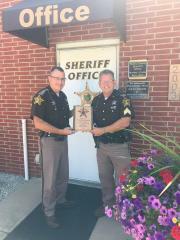 The Ripley County Sheriff's Department honored Sergeant Corky Houseworth with a commemorative plaque. Sergeant Houseworth began his law enforcement career in the Ripley County Jail as a jail officer and was promoted to Deputy on July 6, 1998. Sheriff Cumberworth and the department appreciate Sergeant Houseworth's dedication and service to Ripley County. The Ripley County Sheriff's Office recently purchased a 2016 Ford F-150 truck. The truck will be driven by Jail Administrator Bob Curl and be used for the road crew which will eliminate the need for the county highway to pick up the collected trash. It will also be used for hauling maintenance equipment for the jail and as an added four wheel drive in inclement winter weather. Sheriff Jeff Cumberworth says "The new truck will be a multi-functional tool for our department and an asset to the fleet." The new look for the Ripley County Sheriff vehicles saved thousands of dollars on tax payers' money. Sheriff Cumberworth and his deputies chose to change the color of the Ripley County Sheriff's Deputies patrol cars. The traditional two tone brown paint would have cost the county, not only to special order the cars with the base tan color, but also to paint the dark brown onto the cars after they arrived. This gives the Sheriff's Office not only a new look but also saves money. The cars will be driven by Sergeant Corky Houseworth and Sergeant Abe Hildebrand, who have both been faithfully serving the community for numerous years. Sheriff Cumberworth has implemented a road work crew that will be walking the county roads of Ripley County picking up trash. The Sheriff plans to do this program throughout the year when time is available. The program is for inmates who are low risk, nonviolent, and have already been sentenced. The inmates are monitored by a jail officer at all times. Jail Administrator Robert Curl and Jail Officer Winston Halcomb were eager to get the program started on Thursday, May 14, 2015. Just a reminder to the local motorists, please be conscious of your speed and be aware of your surroundings in a marked work area. April 22, 2015, Ripley County Sheriff's Office received a report from a county resident stating they received a phone call from a Ripley County Lieutenant trying to gain access to personal information. The county resident also stated that the Ripley County Sheriff's Office phone number showed up on the caller I.D. These scams try to scare you by stating there is a warrant issued for your arrest. Please remember never to give out your personal information or send money to anyone unless you know them personally. If you have any questions you may contact the Ripley County Sheriff's Office at 812-689-5558. On Saturday, April 11, 2015, a local Head Start Program held a Bicycle Safety Program at the Ripley County Fairgrounds. Head Start passed out free helmets to the children. Reserve Deputies Matthew Wright and Joe Denzio set up a road course while teaching the children about road safety. 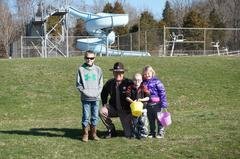 On Saturday, March 28, Ripley County Sheriff's Office helped direct traffic and ensured the safety of the children at the annual Ripley County Chamber of Commerce Easter Egg Hunt located at the Versailles State Park. On March 8, 2015 the Delaware United Methodist Church and the family of Evelyn Bolt presented Chief Deputy Kurt Enneking with a certificate of appreciation for showing respect and honor as Evelyn's funeral procession passed by the jail. On February 9, 2015, as Evelyn Bolt's funeral procession passed by the Ripley County Jail, Chief Deputy Enneking stood at attention, with his head bowed and hands folded in front of him. His actions did not go unnoticed and were greatly appreciated by the family and friends. One of Sheriff Cumberworth's main priorities is for his employees to be professional and respectful to the citizens at all times. Little things do matter. Sheriff Cumberworth is reporting that in the past few weeks the phone scams are back on the rise. One caller stated that they received a phone call from the IRS stating that they had tax warrant and to send them the money by wiring it back. Another case from the Publishers Clearing House stating that they have won $1,500,000.00 but they need to send them $6000 to receive the prize. Sheriff Cumberworth is advising his residents to “NEVER” send money by wire to someone unless you know them personally. And “NEVER” cash a check that was sent to you unless you know who sent the check first. There are several kinds of scams that haunt our community daily, so remember if it sounds too good to be true, then it probably is too good to be true. Please contact the Ripley County Sheriff’s Office at 812-689-5558 if you ever have a question if it is legitimate or not. Ripley County Sheriff's Office is eager to be involved in South Ripley's Hunter's Education Class throughout the school year. Sheriff Cumberworth has participated in this program throughout the last fifteen years. Sheriff Cumberworth presented the archery portion of the class. After completion of the full Hunter Education course, the students will receive a certificate for hunter safety. It is essential for Law Enforcement to be involved with school activities to help guide the kids in a positive direction.